Our guiding vision is to make social infrastructure visible within our communities. 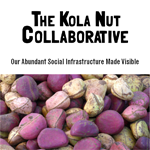 Social infrastructure describes the invisible bonds and relationships which constitute a generative capital that can be accumulated and circulated through timebanking. Our mission is to promote and sustain a robust timebanking infrastructure which supports non-monetary transactions amongst individuals and organizations allowing a greater sum of the realized value of work to be retained and shared within local communities. We are particularly focused on partnering with organizations which have a broad base of stakeholders whom might benefit from deploying timebanking as a method for capturing and compensating work that presently lives in the form of reciprocal goodwill transactions and creating an infrastructure where the time given over to these worthy causes may be traded with other members within the timebank for services those members have offered. Our goal is to develop and sustain a complementary community currency which decreases financial pressure, reinforces the fabric of trust and creates new opportunities for engagement between stakeholders within our communities. Due to heightened interest in the Hourworld timebank managment platform, your application may take some time to process before you are able to log in with your chosen password. Thank you for your patience with our process. We look forward to having you join us in realizing the deep and sustaining value of a visible social infrastructure. *May be eligible for reciprocal agreement sponsorship when 10 or more community stakeholders from an organization join timebank and attend orientation at the same time. +Additional staff accounts available at no added expense to organizational and business members.